admin 5 years, 5 months ago. In this 4th part of his tutorial on Inverters, Nasir drew a list of the different type. Remember you still can send us your articles by mail. As we know that inverters are finding their extensive uses now a days. Previously they were only used in some main applications, which would be large scale and expensive. But now a days, inverters are like a small compulsory electronic device, on which many of our other main electronic equipment depend. They are extensively used, not only because of their universal function of converting DC power to AC power, but also because of their high efficiency, reduced power costs and versatile applications. These days, they are being used extensively in applications where there is a frequent power cut off, because in case of power failures, inverters are a very good and efficient power remedies. For every classification, we form some basis first, depending upon which we can further categorize our results for easier understanding and a better approach. This is done in order to promote better understanding and a more extensive classification of different things. A square wave inverter is one of the simplest inverter types, which convert a straight DC signal to a phase shifting AC signal. But the output is not pure AC, i.e. in the form of a pure sine wave, but it is a square wave. The output of this type of a circuit is a square wave. 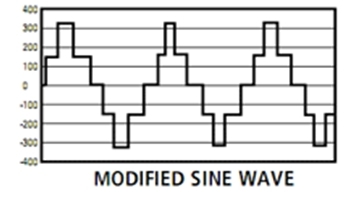 A Modified sine wave shows some pauses before the phase shifting of the wave, i.e. unlike a square it does not shift its phase abruptly from positive to negative, or unlike a sine wave, does not make a smooth transition from positive to negative, but takes brief pauses and then shifts its phase. More efficiency, hence consumes less power. They can be adjusted according to your personal power requirements, since several types are available with different power outputs. The output of a pure sine wave inverter is very reliable, but at the same time, there is a tradeoff between the price and reliability. Due to this reason they are the best option for sensitive equipment. This was all about the types of inverters. However, one must know that which of these types is most suitable for his use. So in the next article I will explain how to select an inverter according to your need. When i finished reading this post, I thought of “how to select the right inverter”, then I read this “So in the next article I will explain how to select an inverter according to your need.”. Looking forward for that article. They all are good for one thing and bad for the other. So, how to choose the best one? depending on many factors, your experty, what you need it for, do you have what it takes and so on.